You can order Epiduo gel online from our UK registered pharmacy. You will need to complete a short medical questionnaire, to ascertain whether or not treatment is suitable for you. We will deliver the medication to the destination of your choice, using a first class courier. Epiduo is a gel that is used to treat acne. It is primarily used to treat mild to moderate acne, associated with blackheads and whiteheads. It contains adapalene, an ingredient in Differin, but also contains benzoyl peroxide, an antibacterial. 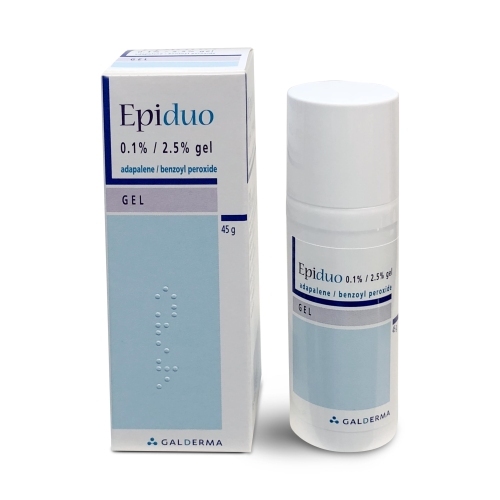 Epiduo gel contains adapalene which is a retinoid. Retinoids are derived from vitamin A, and exert their action by increasing the turnover of skin cells. This promotes your skin to shed cells more efficiently, preventing dead skin cells from blocking pores which cause acne. It also contains benzoyl peroxide, an antimicrobial agent which helps to keep the skin clean and free from the bacteria associated with acne. The two ingredients work well together to treat and prevent acne, and reduce skin inflammation. When should I use Epiduo gel? Epiduo gel should be used after a physician has examined your acne and prescribed you with Epiduo to treat your acne. It should be applied once in the evening. Wash your hands and cleanse your face using a hypoallergenic cleanser that is free from fragrance. Take care to ensure that the gel avoids contact with the eyes and lips, as well as any areas of your skin that may be sensitive (e.g. sunburnt skin or skin that is affected by eczema). Wash your hands after use. How long does it take for Epiduo gel to work? You should start to notice results after a few weeks, but this can vary depending on the individual’s response to treatment, and the severity of the acne. After two months, you should see a visible improvement in acne. If this is not the case, you should make an appointment to visit your GP, who may wish to step your treatment up or change it. It is important to note that you may experience increased skin sensitivity and irritation after the first few days of using treatment. This is your skin responding to treatment and getting used to the cream. How long should I use Epiduo gel for? You should use Epiduo gel consistently for around 8 weeks to see whether or not it is having the desired effect. It is advisable to visit your prescriber so that they can assess your response to treatment. Epiduo gel contains ingredients that have been clinically proven to be effective in treating acne. Studies show that Epiduo gel is more than 50% effective in treating acne in those that have used it. However, we all have different skin types and different responses to treatment. If Epiduo gel has not been successful in treating your acne, you should make an appointment to see your doctor who may wish to start you on another treatment. Who should not use Epiduo gel? Is Epiduo gel safe to use whilst pregnant or breastfeeding? You should not use Epiduo gel whilst pregnant. If you fall pregnant while using Epiduo gel, treatment should be discontinued and you should contact your doctor. Epiduo gel is safe to use whilst breast-feeding, but you should take care to avoid exposing the gel to the infant’s skin. Can I use Epiduo gel with other medication? Epiduo gel is safe to use with most medication, however, you cannot use it at the same time as other treatments for acne that contain benzoyl peroxide, or any retinoids. You should also avoid using other cosmetic products that may have an irritating, drying or exfoliating action on the skin. Epiduo gel is making my skin irritated, is this normal? This is known is retinization, and is the period where your skin is acclimatising itself to adapalene, the retinoid contained in Epiduo gel. This usually happens after 7-10 days and should last no more than one week. If your skin irritation persists for longer than 10 days, you should discontinue treatment and contact your doctor. What if I forget to use Epiduo gel? Apply Epiduo gel as normal the following evening. You should not apply Epiduo gel the following day, as it can cause irritation when exposed to sunlight. You should also avoid putting an extra amount the following evening as it can irritate the skin. Missing one dose will not hamper results in the long-run, but frequent missed doses can slow down and negatively affect results. Can I use make-up with Epiduo gel? Epiduo gel should be applied in the evening before bed. If for some reason, you need to apply make-up, wait for the gel to dry before applying any products.